Both the army and the Tamil Tiger rebels are accused of atrocities in the civil war that ended in 2009. The government previously backed a UN resolution calling for a war crimes court supported by foreign judges. “We have more than enough specialists, experts and knowledgeable people in our country to solve our internal issues,” he said. “This investigation should be internal and indigenous, without violating the laws of the country, and I believe in the judicial system and other relevant authorities in this regard. Asked when the court might be set up, he said: “These things cannot be done instantly or in a hurried manner. A couple of months ago, SL stood proudly and supported a resolution at the UNHRC for an independent judicial enquiry against alleged human rights violations in the last 10 years of the war. 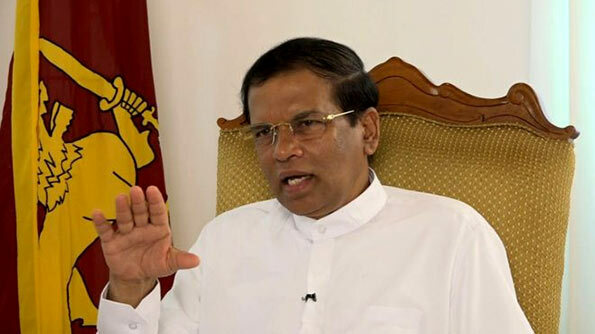 Now, as Sinhala Buddhist leaders always did since 1948, the President states that the mechanism is to be confined to local legal resources. We all know of the quality of justice in SL. The Current CJ Sri Pavan has no control over what goes on in the legal framework. Magistrates are receiving phone calls from previous (and perhaps, some current) rulers and are visibly responding to them. A pretty lady MP was released on bail on a Saturday where Govt Dept’s involved in releasing prisoners were made to work on Sat. I wonder why people are being released after 2 weeks in Remand prison? If the law permitted, why weren’t they released sooner? The whole Supreme Court including the Tamil CJ and the whole Appeal Court consists of individuals who are not worthy of the positions they hold. Another opportunity for true reconciliation is being lost unless the last living patriots, CBK and RW bring this pambaya under control. I hope PM and other cabinet ministters echoing the same idea. We do not need foreign judges!! Before the government or the UNHRC proceed with this farce of a war crime tribunal they ought to get their defenitions right. Based on this then they can proceed with framing charges. What is the role of India and the nadu in particular in this conflict other than to excercise some sort of pseudo colony! If teh army herded the tamils including P and his mob and then exterminated them then there is a definite case of genocide. It did not happen that way it was P who herded the tamil to provide them with a human shield. How were the bodies disposed of …were there any massive graves for cremating 40000 takes a lot of doing particularly in a matter of few days. Even then there must have been some clues left behind. The only evidence that UNHRC has is channel 4 recordings which has never been authenticated. Then the lists have they ever been verified. The government ought to adopt a hard line and challenge the UNHRC on these counts. those in the United Naitions and its affliates that support this system fall in to the same category. Zama your point is well taken. Since the so called ‘last days’ is focused how can a government troops kill 40,000 people? It is certain that hole allegations are framed to punish the Sri Lankan government whiched the war machine of the terror out fit LTTE. Is good to see for the first time HE Sirisena is speaking as a president. The UNHRC boss is due in a couple of days. Channel 4 TV crew arrived a week ago and have been busy in the North. We are about to be hit hard below the belt in the next couple of weeks. The UNHRC boss will conduct a post visit interview with the press where we will be soundly criticised for dragging our feet over implementation of the UNHRC resolution. This will be followed by a Channel 4 documentary, this time showing Chinese incinerators installed in the Nandi Kadal beach spewing clouds of smoke disposing human remains in the weeks that followed the end of the war.